Nepal and Bhutan occupy the most remote landmass in the the Himalayas. The invincible Himalayan landscape however safeguarded diverse cultures and practices unstained until now. The vertically raising slope of Nepal - Bhutan nourished diverse flora, fauna and ethnicity. Nepal was safe hideout for immigrants and political renegades from both India and Tibet from the ancient time. This flourished several distinct cultures in the manifold Himalayan valleys. 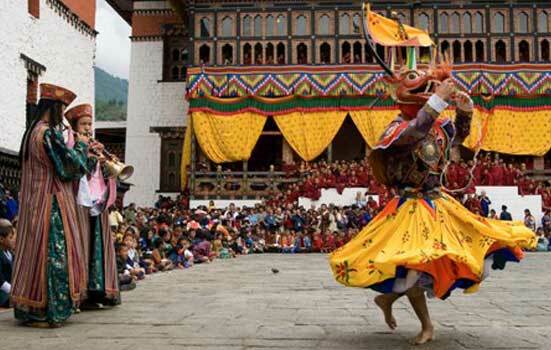 Nepal Bhutan Tour offers best of Himalayan scenery, cultural encounters and biodiversity. Nepal Bhutan tour can be customized from 8 days or longer with trekking or driving through Sikkim to Phuntsholing, Bhutan. After scrumptious breakfast, go on a Kathmandu sightseeing with our expert guide. A day with local guide will give you totally different perspective of the town. Kathmandu has got pagodas, pavilions, sunken water spouts, palaces and great stupas from ancient to medieval time. This is where one can see the magnificence of Newari art, craft and architecture along with great cultural diversity. The 1 hr flight from Kathmandu to Paro is panoramic thrill with the view of sprawling Himalayan peaks crowning lush mountainous country. Our Bhutanese represent / guide will pick us up and together you will drive to Thimphu. Enjoy the scenic drive along the Pachu River. Make break to cross the 15th century suspension bridge and visit the Tachog Lakhang (temple). Check in hotel in Thmphu and if the time permits we will visit the Farmer’s market, Archery march and the craft bazaar. After breakfast tour around Thimphu. We will visit Tashichho Dzong, Memorial Chorten, Buddha Dordenma Statue and the school of traditional painting. You can also visit National Library and Institute of traditional medicine. In the late afternoon, drive to Punakha via Dochula pass. The pass is marked by 108 chortens and offers magnificent view of the Himalayas. Visit the Druk Wangyal lakhang and drive to Punakha. In Punakha we will visit Punakha dzong and Chhimi Lakhang. Chhimi Lakhang is known as fertility shrine where the locals visit to get the blessing of fertility. Walk for about 20 mints through the paddy fields to reach the shrine. The Punakha dzong is situated on the island between two rivers Pho Chu (male river) and Mochu (female River). In the afternoon, drive back to Paro. Day 06: Hike to Tiger’s nest and Paro sightseeing. Drive 20 mints to the base of Tiger’s Nest ( Taktsang monastery ) and hike for about 1.5 hrs to the cafeteria which offers great view of the monastery. Then climb further 1 more hour to the Tiger’s nest monastery perched on the cliff. Walk back down and visit the farmhouse for lunch with the family. Later visit Kichu Lakhang built in 7th century by the Tibetan emperor Songsten Gampo. This is one among the 108 temples built by the Emperor. Enjoy the short scenic flight looking at the long range of the Himalayas. Our represent will pick you up from the Kathmandu airport and check you in the domestic terminal for the flight to Pokhara. This 25 mints flight looks into the Himalayas west of Kathmandu. Check in hotel and have easy day in the town with setting of snow peaks and lake. In the morning, drive 25 mints to the view point at 1,500 m overlooking at the Pokhara valley with panorama of Annapurna. The change in color of sky and snow peaks make the scenery photogenic. Drive back to the hotel and go on a tour after breakfast. Pokhara tour is about getting the feel of nature, Himalayan scenery, geography and historical events. We will visit International mountain museum, cave waterfall (Devi’s Fall from cave) and Tibetan Refugee camp. Take a boat across Phewa lake and hike 1 hr to World Peace pagoda. Drive back to hotel. Drive through the lush valley with charming villages and terraces. The road snakes along Marshyangdi River and then follow Trishuli River out of the mountains. Chitwan is tropical region at the altitude of 150 m. Check in safari lodge nest to the jungle and join the lunch. Later go for a walk and watch beautiful sunset bringing birds and animals to their shelters. You will be taken for Tharu cultural show. Tharu are the aboriginals from Chitwan who had great survival skills in the jungle. Join the buffet dinner and sleep with the sounds of jungle. Chitwan national park is the last remnants of the jungle that once spread from the foothills of the Himalayas till the Ganges. The national park has been successfully preserving the last no of Royal Bengal Tigers and Asian single horned Rhinos. Go on a canoe, elephant back and on foot to look for wildlife. Visit the Elephant breeding center and give a bath to the elephant. Learn about the wide range of birds that migrates all the way from Siberia and acknowledge how we are connected globally. Day 11: Fly back to Kathmandu. Pick up and visit Bhaktapur and Patan. After spending beautiful morning in the ambiance of jungle, drive to the airport to fly back to Kathmandu. Our guide will pick you up from the airport and together you will visit Bhaktapur and Patan. Bhaktapur is know as living museum for it still retains its age-old lifestyle in harmony with its medieval monuments. Patan on the other hand is the Buddhist town with hundreds of monasteries from 6th – 16th century. Bhutan visa and permits. Nepal visa you can get on arrival. All regional and domestic flights mentioned in the itinerary. All accommodation with breakfast and taxes included. 2 nights 3 days Chitwan safari package with all meals, safari activities and park fees included. Delay and cancellation because of natural phenomenon. Meals beside breakfast except in Bhutan and Chitwan national park. Bottled drinks beverages and anythings purchased by clients.